The 18-week target was achieved in 2008, and has been maintained ever since. But for how much longer? The financial squeeze is putting waiting times under increasing pressure, and the Government and NHS are looking anxiously for signs that the 18 week target might be about to blow. There are no definitive signs of this so far. But if there were, what would they be? In this post we will investigate whether the manner of the triumph might herald the manner of the fall: whether the way in which 18 weeks was achieved in the first place might hold some clues about how it might eventually unravel. As we shall see, some strange things happened as 18 weeks was achieved, and there is every chance they might happen again. The headline target (that 90 per cent of admitted patients should be treated within 18 weeks) was achieved in June 2008 and has been achieved ever since. The most recent figures (up to December 2010) show no sign of approaching failure. So far so good. Again, everything looks rosy. Although if you look very closely, the number of over-18 week waiters does seem to be a little higher than in was a few months ago. It might be worth taking a closer look at this. How curious. It looks as though there were still lots of patients waiting much longer than 18 weeks, when the target was achieved in mid-2008. How can this be? It could be that some Trusts achieved the target by carefully admitting only 1 over-18-week-waiter for every 9 under-18-week-waiters, even if there were still plenty of patients waiting for ages. That would be a classic example of achieving the target but confounding the objective. 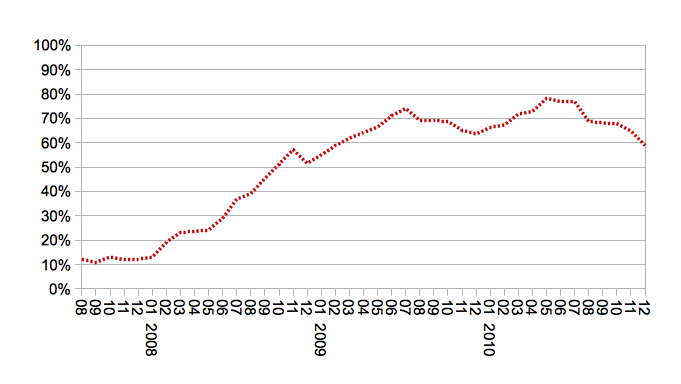 The over-52 weeks column for the number waiting doesn’t fit on the chart, and it’s 17,943 patients high. 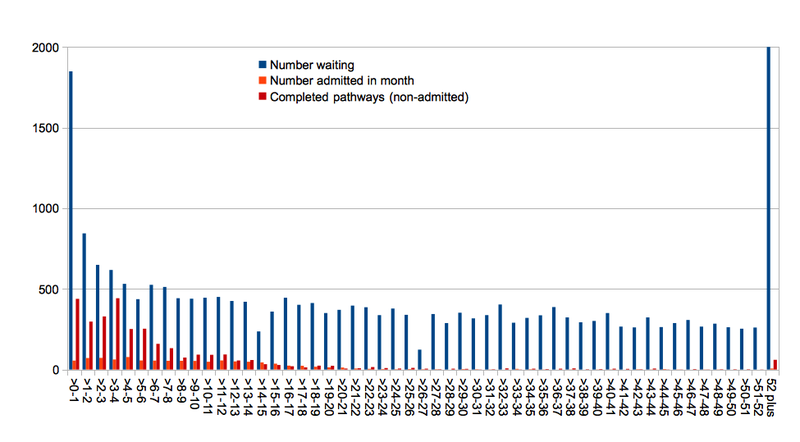 Three-quarters of the patients on the waiting list had been waiting more than 18 weeks. Yet this Trust was “achieving” the headline target, with 90.8 per cent of admitted patients being treated within 18 weeks. If the objective were genuinely to achieve short waiting times for patients, you would expect as much capacity as possible to be directed towards the longest-waiters (while protecting clinical priorities). Instead the headline target throttles it, limiting to 10 per cent the capacity devoted to over-18-week-waiters. We can only learn so much by looking at a single Trust. So let’s look at the picture across the whole of England. 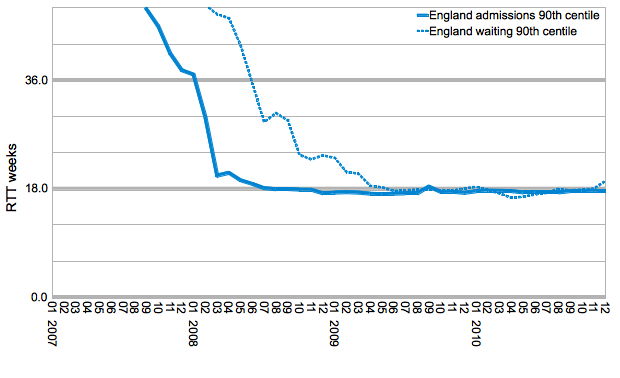 In the following time-series, each English Trust admitting over 50 patients in the month is represented by two points: a blue one showing how many weeks 90 per cent of patients were admitted within, and a red one showing how many weeks 90 per cent of patients still waiting had waited within. Each monthly chart is sorted, so that the red (still-waiting) points rise continuously. While the video is running (it’s only 2 minutes long), notice two things: firstly, the blue points falling like rain in early 2008 to “achieve the target”; secondly, watch where the red line crosses the 18-week gridline, and how it moves to the right much later as waiting times genuinely improve. At the start, back in 2007, hardly any Trusts were achieving 90 per cent within 18 weeks (for those patients still waiting). This rose rapidly as waiting times improved, fell back over the winter of 2009-10, and then rose again; at the peak, over three-quarters of Trusts were achieving 90 per cent within 18 weeks for those patients still waiting. Since then it has fallen again, and in December 2010 – the coldest for a century – it was just below the trough of a year earlier. Is this a sign that 18 weeks is doomed? No; we need to wait and see what the future data holds. Is this a good indicator to watch? Quite possibly. We have seen how Trusts were able to achieve the headline admitted-patients target in 2008, even though their waiting list backlogs were still very long. So it would be unwise to look at the admitted patient (or for that matter the non-admitted patient) records as reliable early indicators of mounting pressures on 18 weeks. Instead, the patients who are still waiting are a better place to look: the so-called incomplete pathways. Even though 18 weeks remains “achieved”, the English waiting list still contains 14,637 patients who have waited over 52 weeks since referral. 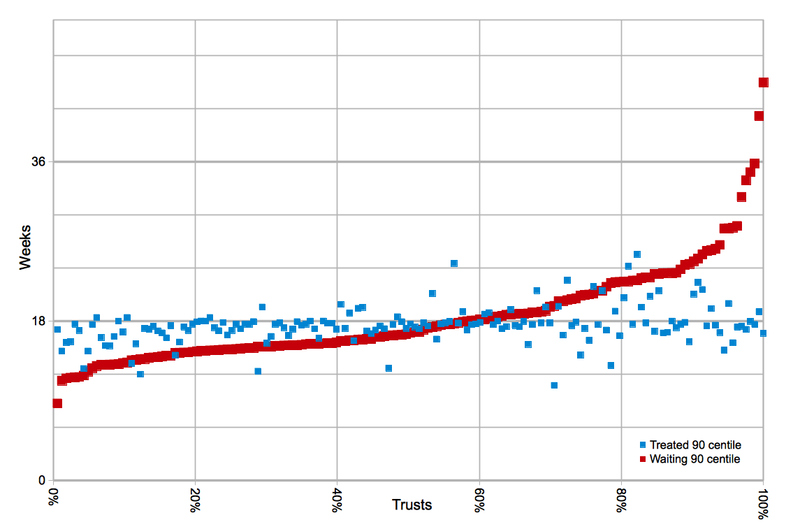 And because there is such variation between Trusts, we need to be looking at the whole spectrum of Trusts to pick up the early indicators; 18 week pressures will not build up evenly.